Anna may not remember her mother - but people who nursed Anna back to health will never forget what happened. After a hit-and-run, a mother wombat was found still alive in a cold and snowy ditch by the side of a road in Australia. A tiny baby, Anna, was in her pouch. Marie, a kind person from Wildlife Rescue South Coast, took Anna and her mother to get help. Anna's mother was given intensive care for four days. 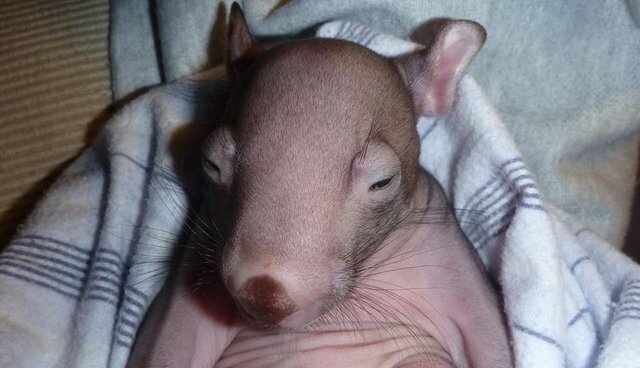 Rescuers had to do the heartbreaking work of removing Anna from her mother's pouch. And sadly, the mother died from her injuries. You might think Anna, having lost her mother so young, is all alone in the world now. But thanks to the rescue center, she's made two good friends, Dan and Ash, who keep her company. Anna weighed just 350 grams when she was found, but she's made huge strides in recovery. Now she's a healthy 1.5 kilograms, the rescue center wrote on Facebook. Anna is "full of energy and adores her two buddies Dan at 5kg and Ash at 4kg." Learn how you can help animals like Anna, Dan and Ash here.